The thin skin around our eyes is one oft he most delicate, but also most demanding areas of our skin. 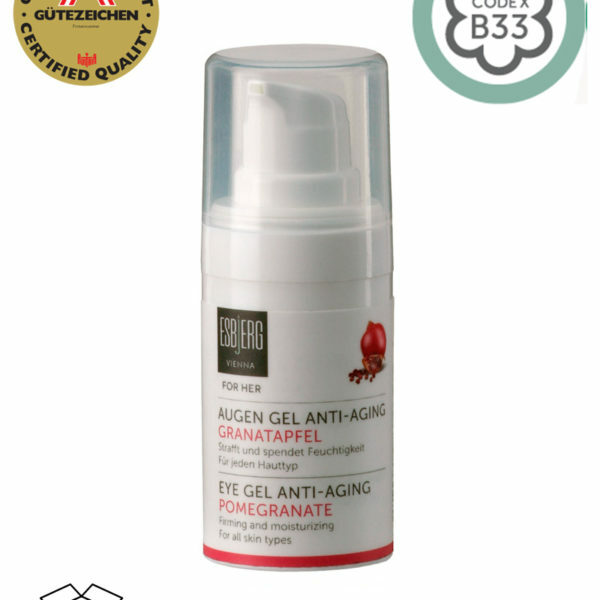 Pomegranate eye gel is immediately absorbed, and effectively reduces dark circle around the eyes as well as lines. 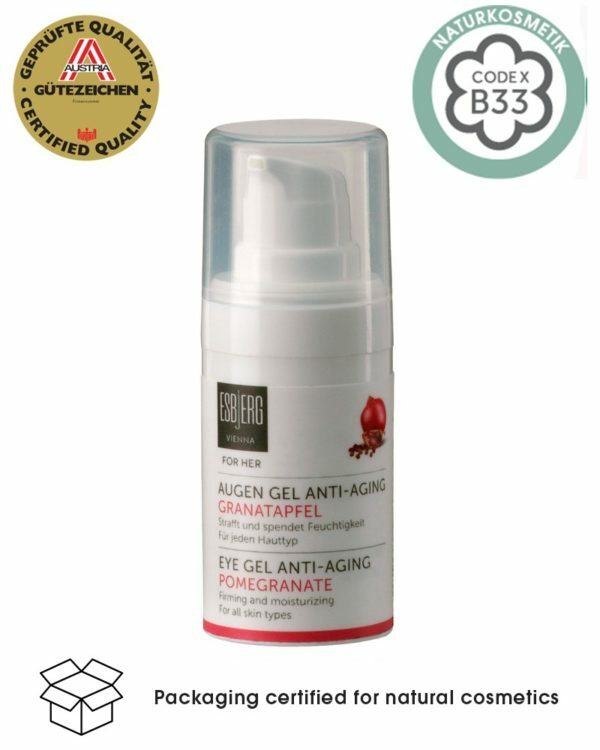 The natural pomegranate eye gel smooths the entire eye area, refreshes and gives the skin a flawless shine. Precious organic pomegranate seed extract not only calms the skin, it also renews cells and stimulates the skin´s self-healing powers. The entire eye area is refreshed and, thanks to organic aloe vera, provided with sufficient moisture. Pomegranates contain powerful antioxidants – the concentration of antioxidants in pomegranate juice is three times stronger than in red wine or tea. The red, succulent arils contain estrogenically active steroids and feature the highest ratio of gamma-linolenic acid in the entire plant kingdom. This triple unsaturated omega-6 fatty acid strengthens the acid mantle of the skin and improves skin elasticity. Even the manufacturing of natural cosmetics can always be improved. Thus, during the manufacturing process and the storage of Esbjerg’s cosmetic products the classical music of Wolfgang Amadeus Mozart constantly filled the air. Additionally special, energized water from the so-called “Schauberger-funnel” was used in the manufacturing process. Plant glycerine stabilizes the barrier function of the skin, moisturizes and increases skin elasticity. The vitamins, mineral salt, amino acids and enzymes of the aloe vera plant are renewed for their healing properties. They accelerate cell renewal, strengthen the protective barrier of the skin, have an anti-inflammatory effect, cool the skin, supply an abundance of moisture and are astringent. Apply a small amount in the morning and evening, gently pat around the eye area.